Fishing licenses issued to any person by either this State or New Hampshire shall be recognized when used on any lake or pond which is partly in both States of Maine and New Hampshire. Balch and Stump Ponds, Acton, Maine and Wakefield, New Hampshire. Great East Lake, Acton, Maine and Wakefield, New Hampshire. Horn Pond, Acton, Maine and Wakefield, New Hampshire. Signs posted at the downstream extent of the Great East Dam Outlet Canal denote the boundary between Horn Pond and the Salmon Falls River. Kimball Pond, Lower, Fryeburg, Maine and Chatham, New Hampshire. Milton Pond, Lebanon, Maine and Milton, New Hampshire. Northeast Pond, Acton and Lebanon, Maine and Milton New Hampshire. Province Lake, Parsonfield, Maine and Effingham/Wakefield, New Hampshire. Salmon Falls River, Acton, Lebanon, Berwick, and South Berwick, Maine, and Milton, Rochester, Somersworth, and Rollinsford, New Hampshire. Included is the upper reach of the Salmon Falls River beginning at the outlet dam of Great East Lake, also known as State Line Canal, to a point downstream marked by signage indicating the northern terminus of Horn Pond. Spaulding Pond, Lebanon, Maine and Milton, New Hampshire. Townhouse Pond, Lebanon, Maine and Milton, New Hampshire. Umbagog Lake, Upton, Maine and Errol/ Cambridge, New Hampshire. Waters of Umbagog Lake include the waters of the Androscoggin River downstream to the Errol Dam, the waters of the Magalloway River upstream to coordinates 44.795602°-071.062732° to 44.795602°- 071.061793° using WGS84 map datum, and the waters of the Rapid River upstream to the red markers at Cedar Stump in the State of Maine. General Fishing Laws listed below apply to New Hampshire border waters that do not have Special Fishing Laws. If a water has Special Fishing Laws that differ from the General Fishing Laws listed below, they will be listed in the Special Fishing Laws section. January 1 to March 31: Lakes and ponds are open for all species except landlocked salmon and cusk. April 1 to September 30: Lakes, ponds, rivers, streams and brooks are open to open water fishing for all species. October 1 to December 31: Lakes and ponds are open to open water fishing for all species; all trout, landlocked salmon, and togue must be released alive at once. October 1 to March 31: Rivers, streams and brooks are closed to all fishing (except Salmon Falls River). Ice Fishing: Not more than five (5) lines per person (except Great East Lake). Open Water Fishing: Not more than two (2) lines per person. From May 15 to June 30: Black bass (largemouth and smallmouth) may be taken only with artificial lures and flies. 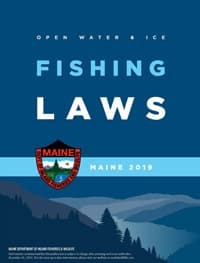 No dead or living pickerel, goldfish, yellow perch, white perch, black bass, sunfish, crappie, horned pout (bullhead), carp, or any spiny finned fish shall be taken, sold, or possessed for use as bait for fishing in New Hampshire-Maine interstate waters. Rainbow Trout 2 fish 10 inches in lakes and ponds. 6 inches in rivers, streams, and brooks. Brown Trout 2 fish 10 inches in lakes and ponds. All Black Bass must be released alive at once No minimum length limit. Only 1 may exceed 14 inches. All other species: No daily bag, possession, or length limits.